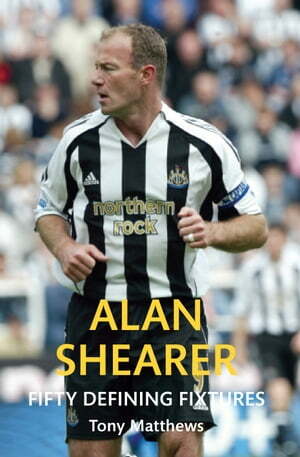 Collins Booksellers - Alan Shearer Fifty Defining Fixtures by Tony Matthews, 9781445651330. Buy this book online. Alan Shearer OBE (born 13 August 1970) is an English footballer whose prowess saw him score a hat-trick in his professional debut in 1988 while playing for Southhampton. Leaving Southhampton in 1992, Shearer went on to play as a striker for Blackburn Rovers and Newcastle United, where he stayed until the end of his career in 2006. Widely regarded as one of the world’s best strikers, his goalscoring talent saw him bcome both Newcastle’s and the Premier League’s top goalscorer in the 1995/96 season. During his career as a player, he captained England in 1996 and Newcastle from 1999 and scored a massive 283 league goals, of which 260 were in the Premier League, and a recored eleven Premier League hat-tricks. Named Football Writers’ Association Player of the Year in 1994 and the PFA Player of the Year in 1995, Shearer is one of the greatest footballers England has produced. In Alan Shearer: Fifty Defining Fixtures, Tony Mathews oulines why Alan Shearer deserves to be recognised as a legend of the beautiful game.